When the chips are down, turn a condescending political epithet into a badge of honor. 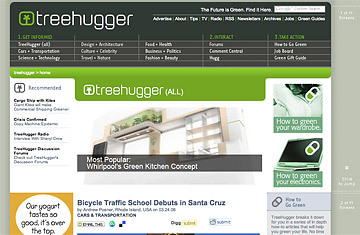 TreeHugger is the go-to guide and news feed for sustainable living. The site became the emerald in the crown of communications giant Discovery Communications, which bought it last year. As a Web presence for Discovery's new Planet Green project, TreeHugger covers pretty much the entirety of the sustainable lifestyle, offering tips on how to "green" your baby, wedding, funeral, and everything in between. The site interviews influential, er, tree-huggers generally left out of the mainstream papers, such as writer-entrepreneur Paul Hawken and Canadian national treasure David Suzuki, a lifelong environmental activist. Sample TreeHugger post: Get back to basics and try old-fashioned wooden toys and organic cotton or homemade teddies. Because babies put most things in their mouths, go as natural as possible, then when baby is a little older, get hold of second-hand toys. Also aim for toys that help build a child's bond with nature and the natural world. The sad truth is that the average American kindergartener can identify several hundred logos and only a few leaves from plants and trees.